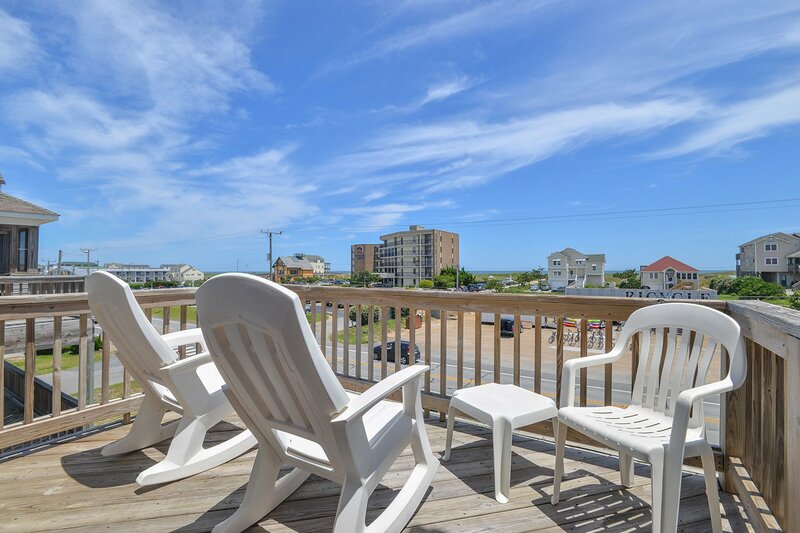 A wonderful vacation awaits when you choose this lovely home for your Outer Banks getaway. Beautifully decorated & nicely furnished, all the extras are provided for your family to enjoy in this lovingly cared for home that is close to the Beach. Designed to meet the needs of your entire family, this home has an Elevator that serves all three luxurious levels, Ocean Views, a Private (12x25) Swimming Pool, Hot Tub, Game Room & Excellent Beach Access. This Beautifully Furnished & Decorated Home is Only 50 Ft. from Beach Access. Ground Level: Parking for 4 Cars, Covered Entry, Elevator, Large Den & Game Room Area w/TV, Blu-Ray DVD, Foosball Table, & Books, Queen Sleep Sofa, Half Bath, Wet Bar w/Mini-Refrigerator, Microwave, Laundry Area, Access to Pool Patio Area, Private Swimming Pool & Enclosed Outside Shower w/Dressing Area. Mid Level: 3 Bedrooms (1 Master Suite w/Queen, TV, & DVD, & Full Bath w/Tub & Shower, 1 w/Queen, TV, & DVD, & 1 w/Duo Bunk & TV), Shared Full Bath w/Shower Only, Den w/Queen Sleep Sofa, TV w/Blu- Ray DVD, & Half Bath, & 2 Covered Decks. Top Level: Spacious Living/Dining/Kitchen Area w/Half Bath, & TV w/Blu-Ray DVD, Master Suite w/King, TV w/DVD, & Full Bath w/Jacuzzi Tub & Shower, & 2 Sun Decks. Features include:: C/AC & Heat, Washer/Dryer, Dishwasher, Microwave, Keurig & Regular Coffemaker, Phone, 6 TVs, DVDs, Stereo w/CD, Wireless Internet, Ceiling Fans, Baby Equipment (High Chair, Pac-N-Play, & Baby Gates), & Pool & Deck Furniture. No Pets. This is a Non-Smoking Unit. Elevator 36 Inches Wide. Doorways Do Not Allow Wheelchair Access. This is the 3rd time I've rented Carolina Dreamin and last year, we stayed in Summer Breeze, which was owned by the same people. Thank you for sharing your homes!!!! Staying at Carolina Dreamin is truly our little slice of heaven on earth, even if it's for a week. So many great memories!!! This was a great home and my family, especially my grands really enjoyed our stay there. I would not like return because I like to experience different homes when I book for vacations in this area. This home was very special and so enjoyable. All family members liked the amenities. All the "old folks" loved the elevators. My wife has MS, the elevator was a God send. More homes should have one. We have rented this house 3 times, and every time it gets better and better. We absolutely love this house and will rent it again. We really love the house and the location but especially love the elevator! Makes things so much easier. Will try and rent again next year. This house is spotless and awesome! Close beach access, central to many great places to eat and activities to do with your kids. My boys love the game room and pool! This was our second stay in Carolina Dreamin and we loved it even more this year - great house! Your family will enjoy staying here for a week of fun and memories! Very nice and clean was just like being at home. This home is wonderful for families who want a short walk to the beach! There are two accesses directly across the street and a nice gas station, souvenir stores, etc. all within very close walking distance. The home had everything we needed and we thoroughly enjoyed our stay. Home is very nice with updated TVs, comfortable beds, and the pool and hot tub are perfect! We had a great vacation home. Joe Lamb, Jr. staff was SUPER in assisting with the house. Since the house was ready earlier, they let us go into it early. My husband was so thankful for he was very tired. My husband has breathing problems and had open heart surgery a few years ago. The elevator was a wonderful help to him. The house was clean and affordable. We have been with Joe Lamb for years. Never had a problem with them. This is a beautiful house and we were very pleased to have the opportunity to stay in this house for our vacation. Great vacation spot, well appointed. Joe Lamb consistently has the best rentals year after year. Thanks for a great vacation! Our family thoroughly enjoyed this gorgeous, immaculate home. Close beach access and convenient to all the best places to go in OBX! By far the best home we have ever stayed in through out our 20 years of coming to the Outerbanks. We had a great week in this house and we know you will, too! This home is situated in a busy, but very convenient location. The home is clean and well maintained with nice TVs and decor. Beach access is right across the street, making it easy to hit the sand. We enjoyed the pool and hot tub area. Would recommend this house.